A lover of fresh, seasonal food, it wasn't hard to convince me to try Print Restaurant in Hell's Kitchen, which caters to just that philosophy. I was treated to a plethora of goodies from their menu - my dining companion and I sharing a variety of appetizers, entrees and a wealth of desserts too. Elegant, lush and earthy are words I'd use to describe Print's atmosphere. Located in the modern Kimpton Ink48 hotel on 48th Street and 11th Avenue, the restaurant fits in with its elegant surroundings, exuding style without pretension. The long rectangular dining room is well spaced out and set up for different sized parties - from private tables for two or four to a large communal table that encourages cross-conversation. I appreciated the simplicity of the decor and the warm browns and greens in the furniture and accessories that helped set the mood for this very natural and delicious meal. Knowing that the food at Print is as fresh and as local as can be, I couldn't wait to peruse the menu, which believe it or not, changes daily. Print also boasts a full-time forager, who's sole job is to find these locally-sourced ingredients from nearby farms and vendors. It's really cool to think that this person's daily activities help shape the menu. The first thing I heard about was Print's goat cheese gnocchi, which was expertly stuffed with this tangy cheese and coupled with Brussels sprouts, cauliflower, pancetta and pea shoots. 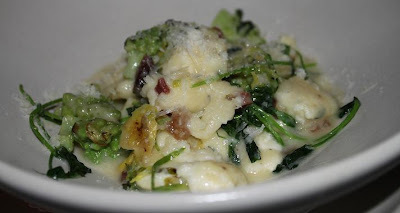 It was my favorite appetizer because of its delicate texture yet hearty bite, reminding me of my favorite winter food, halusky (spaetzle) with sheeps milk cheese and bacon that I get at Koliba. Other apps we tried included a spinach-leek soup with a cheddar crouton; a prosciutto-artichoke salad; and a seafood ceviche. 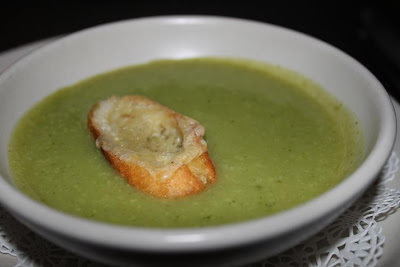 All three were excellent, but I had a strong preference for the soup, which was once again very weather appropriate and the cheesy crouton that floated on top was a great way to make this already rich soup even more luxurious. We split two very different main dishes, both of them showcasing Print's excellence in protein preparation. The first was a farm fresh grilled chicken breast on the bone, paired with colorful veggies such as Brussels sprouts, carrots, onions, purple potatoes and cauliflower. All these earthy accouterments made a simple dish a lot richer and exciting, both visually and in terms of taste. I very much enjoyed the chicken, and since cooked on the bone, it was a lot juicier than your everyday boneless breast. 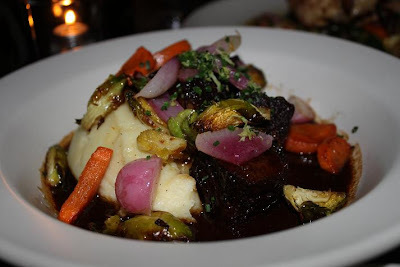 The other entree we had were the braised short ribs with creamy mashed potatoes, radishes, turnips, carrots and a horseradish gremolata. Once again, a beauteous plate of bright colors, the meat was by far the winning element. It was so tender and succulent, separating easily with the gentle tug of the fork. The meat juices were plentiful and did a great job of further flavoring the already delicious mashed potatoes and the fresh veggies. Welcomed by a six-course dessert offering, at this point, my eyes were bigger than my stomach. Amongst the amazing choices, two desserts stood out to me including Print's signature Chocolate Bread and the whipped chocolate flan with Seven Stars Heavy Cream. 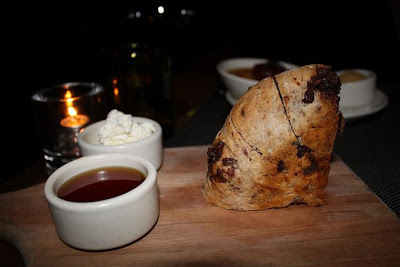 The former still makes me salivate upon thinking about it, made up of a large corner piece of rustic bread, studded with large chunks of dark chocolate. It's meant to be eaten in a free-form fashion by breaking off chunky pieces, instead of neatly slicing them. You can eat the slightly warm bread on its own or pair it with the locally sourced fresh ricotta cheese from Salvatore Bklyn or the sweet, floral honey from Catskill Provisions. My other close favorite, the whipped chocolate flan was so decadent yet so light to eat that it seemed too good to be true. Consisting of a light chocolate base, drowned in the most luscious whipped topping, it was almost like eating a cooling, dessert soup. 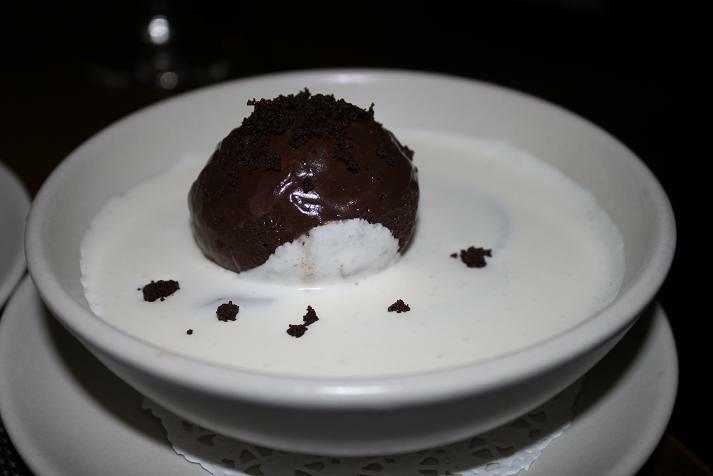 A moderately-sized scoop of dark chocolate sorbet rested on top of the cream, and made the dish refreshing. Our servers were professional, poised and knowledgeable about the food. They appeared at the most opportune moments, enabling us to have a lovely evening with free-flowing conversation, excellent food and wine. All courses were paced well and the waitstaff wasn't too quick to clear the table, which was appreciated.